I’m a few days late to the Star Wars party, sorry about that. But let’s all pretend that it is actually Star Wars Day today, and that my t-shirt says ‘alliance’ underneath, yeah? For anyone else in London or the South East, there seems to be a feeling of collective euphoria – Londoners are offering each other seats on the tube and in a demonstration of highly irregular behaviour are even going out of their way to help tourists. Why, you ask? Well, it’s a Bank Holiday so a delicious three-day weekend – and if that wasn’t enough, the weather is forecast as sunshine all weekend, a veery light breeze, and between 22 and 25 degrees celsius. I’m currently sitting under an arch in the old Royal Naval College in Greenwich listening to conservatoire students polishing their piano and violin pieces and bathing my toes in the sunlight. As with many of us, I really struggle with winter. The days are so awfully short and the weak sunlight begins to fade from about 3pm. Trudging home in the dark, shivering as I lose the feeling in the ends of my fingers and close to tears because I forgot my gloves or someone shouted at me on the train for shoving them when it was the person behind me pushing me forward. People seem terser, meaner, and colder in all senses of the word. Winter feels like a million miles away as I’m sitting here in May, the sun bright and warm, in just a t-shirt. These moments where I look back on just a few months ago bring a strange sense of calm. I’m grateful when winter ends, and I’m grateful for these days when I remember just how lucky we are to have some days where the stars align and bring us the perfect day. I hope you all manage to find something perfect in your long weekend. And if you don’t, or you’re not lucky enough to have a long weekend, I hope you remember how you feel now so when the perfect day does come along, you can be grateful to have experienced it. For delicious gluten-free cakes in London, I can heartily recommend Ruby’s of London who have a stall at Greenwich Market at the weekends. They have plenty of vegan options (and gluten-ful options for you lucky ol’ wheat eaters out there!) 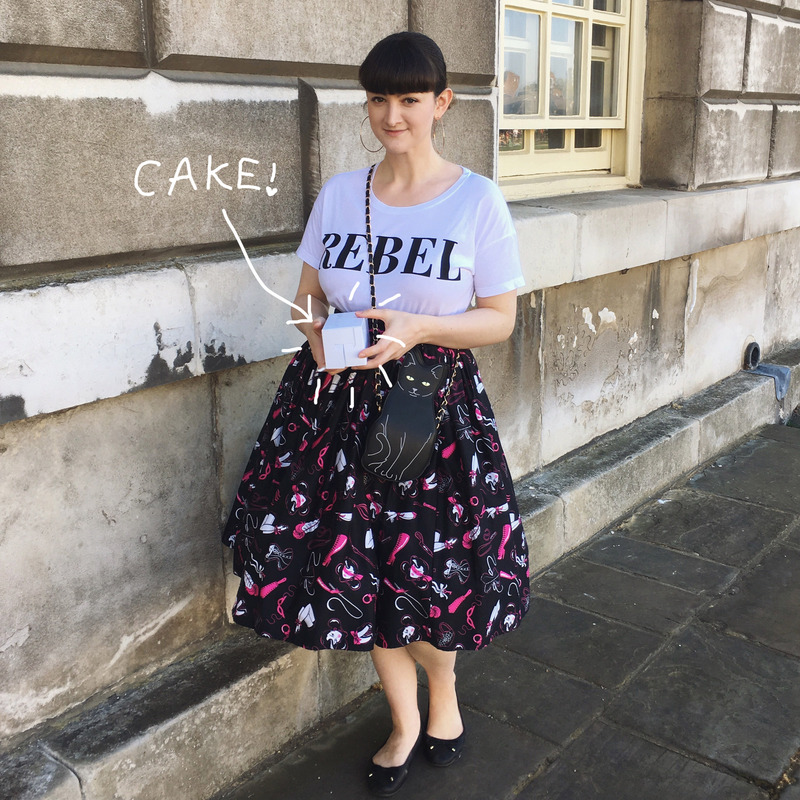 – but get in early, as the cakes sell out fast! Well hello there! I am a 50s fashion fanatic living in London with my collection of long-suffering plants and an entire wall of books. I love to write - sometimes fiction, and often musings on topics like mental health. I love dogs, brooches and the seaside, and I will do literally anything for cheese.